AHR! Summer Reading! | AMERICAN HISTORY RULES! ← Closing the books on American history! Young historians, as the summer comes to a close, you are hopefully completing your summer reading choice assignment and completing a creative review of your book. 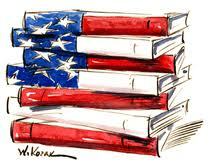 Remember, you can choose ANY book (fiction or nonfiction) that deals with American military service. If you are still looking for a good read, check out my Summer Reading Good Reads page. Once you have read the book, your assignment is to complete an online review using ONE of the activities described here . Send the finished project link to me and I will assemble everyone’s review!